Over the years, collectors of Star Wars toy prototypes have become familiar with a whole lexicon of arcane terms, most of which probably sound like gibberish to the uninitiated. (Don't feel bad for the uninitiated -- they at least have money to spend on things like clothing and food.) They've also come to appreciate the various materials that contributed to the creation of the objects they collect. One such term, and one such material, is Dynacast. No, Dynacast doesn't have anything to do with volcanoes or Scientology, even if, with a little effort, its cold and unyielding stiffness might be compared to Tom Cruise's acting. It's actually the commercial name of the green, ceramic-like stuff that was used to create many of Kenner's hardcopies. Cast and assembled by hand, hardcopies were the prototypes that were used to generate tooling; they were also used to represent product in photography and at industry shows. But that's just trivia, right? Surely a collector wouldn't be interested in ephemera related to a casting material. If that's what you're thinking, you've underestimated the nuttiness of collectors. Below is a receipt I acquired years ago from a firm to which Kenner farmed out the creation of hardcopies during the early '80s. As you can see, it documents the sale of four 20-pound units of Dynacast. The product would have come in a kit -- apparently weighing 20 pounds -- consisting of two parts, a base and a catalyst. When mixed together, they'd harden into the rigid, green stuff that I like to call "fool's kryptonite." Note the date: June of 1981. It was around this time that Kenner was developing the Micro Collection and the later action figures from The Empire Strikes Back line. Therefore, it's very possible that some of the Dynacast received in this order was used to create a Star Wars item. If not, there's always Strawberry Shortcake. The guy we dealt with told us that, at one time, whole storage spaces at this company were filled with Kenner material, including hardcopies and molds for the 3.75" Star Wars line. When he tried to return it to Kenner, they told him to trash it -- they had no use for it. So he did: into the dumpster it went! He saved the Micro stuff because the hardcopies for that line, in contrast to those for the action figures, were large, sculptural, and all in one piece. He imagined that he'd use the molds to make -- no joke -- a custom chess set. So, in a way, you can thank the game of chess for the survival of a whole bunch of Micro molds. Now maybe you nerdlingers will appreciate chess for something aside from its resemblance to dejarik (yes, I had to look that up). Here's another receipt, this one recording a purchase of the room temperature vulcanizing (RTV) silicone rubber used to make the aforementioned molds. It dates from March of 1981. Like Dynacast, this RTV rubber came in two parts, a base and a catalyst. The person making the mold would lay the original sculpt in clay, build a box around it, and then cover it with the mixed RTV. When it had cured, he'd flip the entire thing over, remove the clay, apply some mold release to the cured rubber, and pour the second half of the mold. You can get a rough sense of the process in the video found here. Of course, Kenner also used other substances to create hardcopies. In addition to our beloved fool's kryptonite, they used brown, tan, white, and even black urethane materials. The black has often been referred to as Repro 10. However, I'd never seen documentation of the name until I came into possession of the below shipping container, which has the product's name printed on its sides. The box was obtained from a former Kenner employee, who confirmed that it was used used to ship a urethane product. I love the term "tooling plastics." 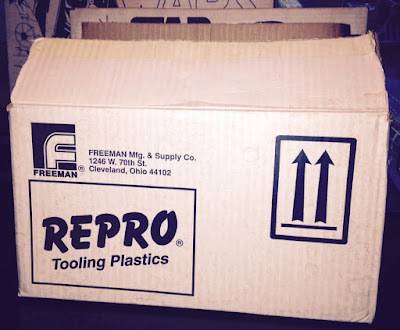 The address on the box indicates that it dates from after 1984, when the Freeman Manufacturing and Supply Company moved to Cleveland. But I'm sure the company's pre-1984 boxes looked fairly similar. 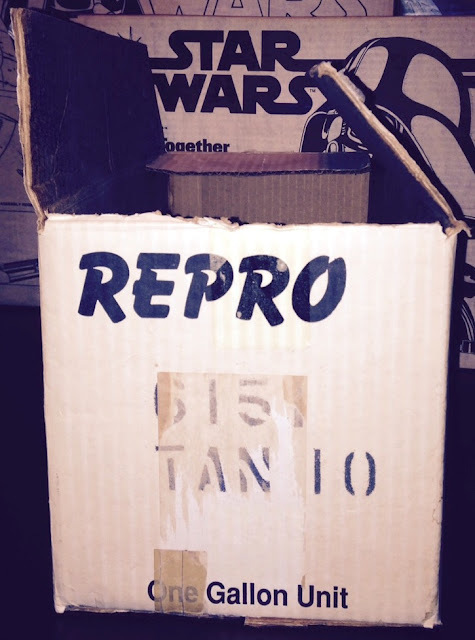 The side of the carton proves that the product shipped inside of it was Repro 10, though in this case it was tan rather than black in color. Apparently, it was available in both hues. Earlier I mentioned acquiring a bunch of molds and coin hardcopies. 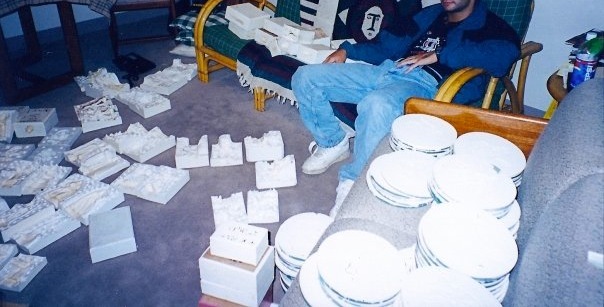 Here's a photo from 1999 showing some of that material. You can hear more about this find in this episode of The SWCA Podcast. Do you listen to the podcast? If you enjoy this blog, you might consider checking it out. Monthly (more or less) installments can be accessed here.